You'll be £13.50 closer to your next £10.00 credit when you purchase Flight Craft 8: Mikoyan MiG-31. What's this? Order within the next 2 hours, 31 minutes to get your order processed the next working day! The MiG-31 started life as an advanced derivative of the famous MiG-25P interceptor, becoming the first Soviet fourth-generation combat aircraft. First flown in 1975, it differed from its progenitor primarily in having a crew of two (pilot and weapons systems operator), a highly capable passive phased-array radar – a world first – and new R-33 long-range missiles as its primary armament. The maximum speed was an impressive Mach 2.82, the cruising speed being Mach 2.35. The type entered service in 1981; more than 500 copies were built between 1981 and 1994. The powerful radar and other avionics allowed the MiG-31 to operate as a 'mini-AWACS' scanning the airspace and guiding other interceptors to their targets; a flight of three such aircraft in line abreast formation could cover a strip 800 km (500 miles) wide. To this day the MiG-31 remains one of the key air defence assets of the Russian Air Force. 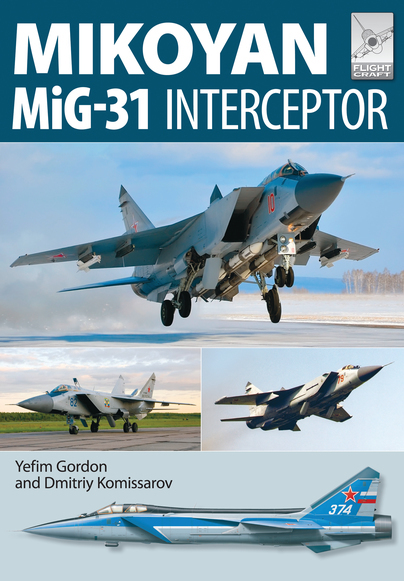 The book describes the MiG-31's developmental history, including upgrade programmes, and features a full and comprehensive survey of the various MiG-31 model-making kits currently available on the market. The model makers are well provided for by the authors, but this is also a book that provides solid information on the aircraft and a selection of images that provide even more information at a very affordable price. The MiG-31 marked a major increase in Russian fighter capability. The authors have captured the history and significance of the aircraft – recommended. Number 8 in the Flightcraft series of soft cover books from Pen and Sword, and another interesting subject from authors Yefim Gordon and Dmitriy Komissarov. The Mig-31 remains an important element in Russian aviation, an aircraft developed from the earlier Mig-25. The 96 pages make up into an excellent reference on the type, and having grown up during the Cold War, when information and photos of Soviet aircraft was limited, this is such a welcome contrast to see the level of information and the number and quality of photographs that are now available to modellers and aviation enthusiasts as evidenced by this new book. It is split into 10 elements. The first 7, which take up the first 70 pages of the book, give an Introduction and background to the evolution of the Mig-31 design then 'From 'Bats' to 'Dogs' as it takes shape; The Kennel (Foxhound variants): Upgrades and Special Versions: The New Generation of Foxhounds: The Mig-31 in Action: and the Mig-31 in Detail. As well as informative and detailed text, all these are well illustrated with a large number of good quality photos, which in turn are well captioned. Then at page 70 we get to the Modellers Corner where they list and assess the various kits of the Foxhound that are on the market in various scales, and show a number of them built up. This is followed by a series of Line Drawings and finally 7 pages of good colour profiles. The Flightcraft series is developing very nicely, good for both aircraft enthusiasts and modellers in equal measure. I find myself sitting in both those camps and this also helps for adding to my own knowledge of these machines that were once part of the Warsaw Pact 'bogeyman', which used to be largely hidden behind that Iron Curtain. Now the curtains have been opened, we can see this extra aspect of these aircrafts. Yefim Gordon was born in 1950 in Vilnius, Lithuania. He has been researching Soviet and Russian aviation history for more than 40 years and has one of the world's largest photograph and document archives on the subject. A professional aviation journalist and photographer since 1989, Yefim Gordon has published hundreds of features and photographs in Soviet, Russian and foreign aviation magazines. He has also authored and co-authored well over 100 books on Soviet and Russian aviation which are published in seven countries. He is a co-owner of the Moscow-based aviation publishing house Polygon Press Ltd.